How to create a Lesson using the Match and sort Component? You can use this component to have your students match or sort the answers by dragging them to the relevant placeholders. This will give the users evaluate their knowledge effectively in an interactive manner. You can use this component to create 2 types of questions. 1. Drag and drop matching Questions: The user will drag and drop the boxes with answers to relevant place holders to match them with the questions. You can use this component when you want to let your students match the answers to their corresponding questions. With this same component, they can sort the given answers by dragging them into the respective placeholders. User can match or sort the boxes with answers on the right side by dragging them to the respective placeholders. The user clicks the Submit button. If the user has matched or sorted all the answers correctly, they will be highlighted in green. The Final Feedback is shown in the grey panel at the bottom of the page. The Submit button disappears. If the user hasn’t matched or sorted all the answers correctly, the wrong answers will be shown in red. The First Attempt Feedback is shown in the grey panel. The Submit button turns to Retry. The user clicks the Submit button and matches or sorts the answers. If the user has matched or sorted all the answers correctly, they will be highlighted in green. The Final Feedback is shown in the grey panel at the bottom of the page. The Submit button disappears. If the user hasn’t matched or sorted all the answers correctly, the wrong answers will be shown in red. The Second Attempt Feedback is shown in the grey panel. The Submit button turns to Show. The boxes are shown correctly matched or sorted. Final Feedback appears in the grey panel. The below are the initial common steps involved in creating a question with this component. Then click on the Match and sort component icon as shown in the above image. You will see a screen similar to the image shown below. Add an optional title in the Title  field. This same field will be visible in the Task tab as well. Add an optional background image to the page using the Background Image  title. Update copyright details of the uploaded image by clicking the Edit copyright  button. Add description texts to the Description Left  and Description Right  fields. Add an optional divider by checking the Divider  button. Update contents for the First Attempt Feedback , Second Attempt Feedback  and Final Feedback . Set the direction of the arrow by checking the Inverse Arrow  checkbox. Switch between matching and sorting by checking the Sorting  checkbox. 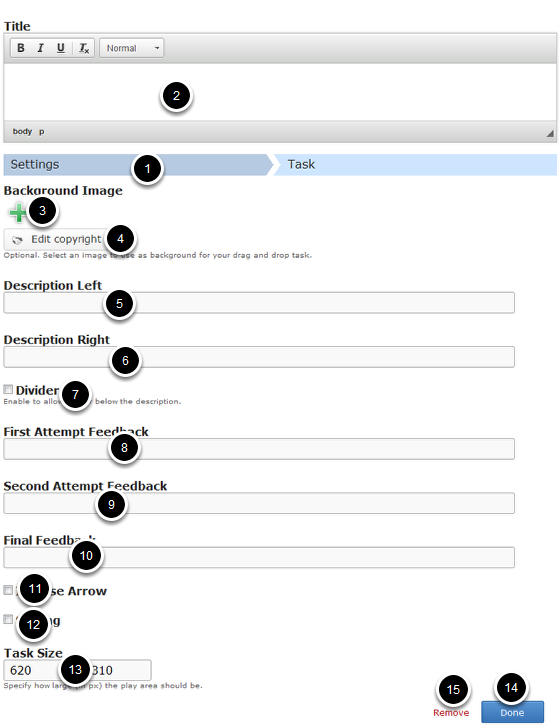 Set the size of the task by updating it in the Task Size  text boxes. 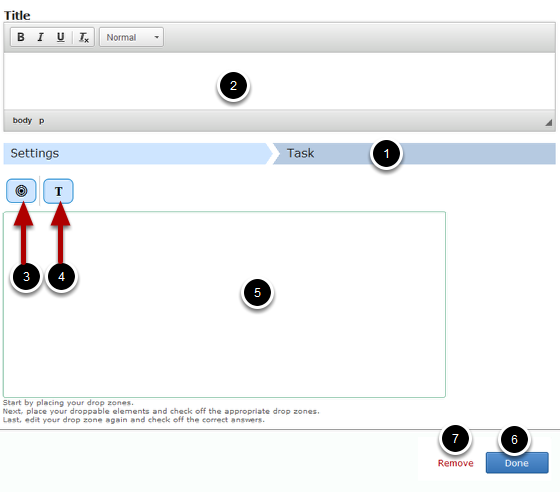 Once you’ve made the required changes on the Settings tab, move to the Task tab as shown in the below image. Add an optional title in the Title  field. This is the same field which was visible in the Settings tab. Add drop zones buy clicking the Drop Zone  icon. Add draggable boxes with answers or boxes with labels by clicking the Insert text  icon. Organize the boxes in the Background Area  of the task. If you've added any background image, it will appear here. Once you’ve added the component, you can create a question of any of the 2 types of this component mentioned earlier. You can check the documents for these 2 types to learn how to create a question of these types individually.